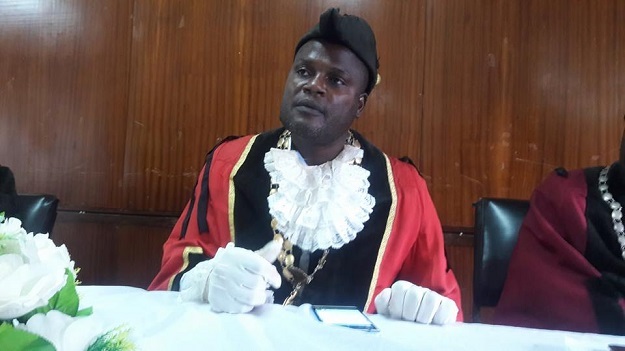 The Zomba City Mayor, Christopher Jana has called for participation of more stakeholders in tree planting exercises around Mulunguzi Dam catchment area to sustain the availability of portable water in the city. Jana was speaking on Friday at Mulunguzi Marsh where Sourthern Region Water Board organized a tree planting exrcise. His worship mayor, Christopher Jana who was also a guest of honor at the event hailed Southern Region Water Board (SRWB) for embarking on the initiative which he described as ‘wonderful’. However Jana, bemoaned low patronage of institutions coming in afforestation initiatives. He therefore asked other institutions to emulate the gesture by Southern Region Water Board. “I really appreciate the management from Southern Region Water Board for the tree planting initiative, it is unfortunate that here in Zomba we have so many companies like ESCOM, Malawi Housing Corporation (MHC) but they don’t do this,”said Jana. On his part, the board’s chairperson Luther Mambala said it is the obligation of the board to plant trees annually to protect the Mulunguzi Dam. He said the board will donate fire hydrates to the forestry department to protect the trees from arsonists. “It is our responsibility as Southern region water board to plant trees around our catchment area to protect Mulunguzi Dam,”said Mambala. Southern Region Water Board has utilized money to the tune of 9 million Kwacha to support the initiative and has planted 20 thousand tree seedlings.